It was a very enjoyable and relaxing day. Great view of the pit lane and track and the circuit is very easy to walk around and get into. Staff were very friendly and knowledgeable as well as free drinks and food were great. The only thing that upset me was the hospitality did not open until 5 or 10 minutes before the morning session started and they didn’t have the glass doors open to see the cars come out for the first time of the day. This upset me as I wanted to have my girlfriend see the cars as they were leaving the pits for the first time and she missed that. However it was a great day. 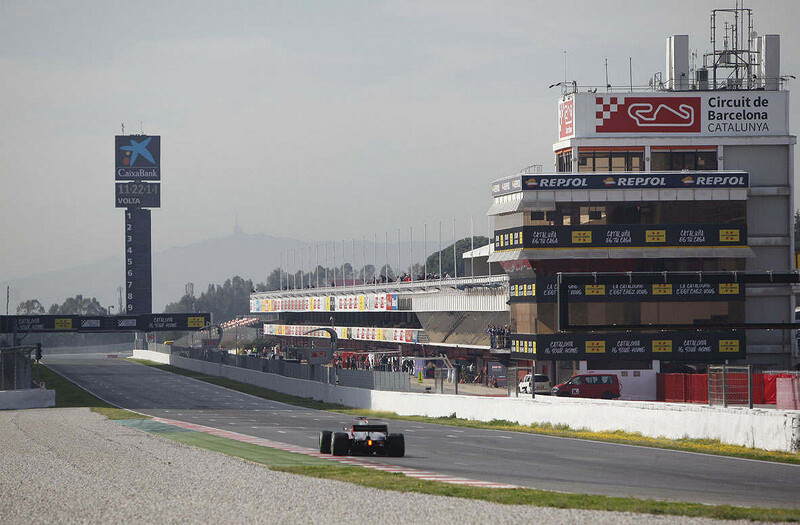 We were fortunate to be able to join the Renault F1 Team for official practice in Barcelona. It was an incredibly memorable occasion and we were treated to a genuine first hand experience of daily life in an F1 team, on circuit. Our visit included team hospitality, garage and pit lane access, seat access in a private grandstand and the highlight, meeting the drivers and other distinguished guests and team members. Our hosts were knowledgeable, accommodating, courteous at all times and they had the whole day mapped out with precision. We received excellent gift packs including a motorsport jacket, all day refreshments and we were made to feel really welcome by all concerned. Thank you Motorsport Live, Winfield and Renault F! Motorsport. This package provided excellent value for money. We have previously enjoyed different levels of F1 hospitality but this surpassed and exceeded our expectation by a very long way and we are already looking forward to repeating the experience next year. Very good organization and venue Beautiful circuit Smiling people ! It was a great day with everything taken care off to the max👌🏾 Top notch experience! Booking was very easy with prompt responses from the customer service team . The hospitality was well organised with plenty of staff familiar with the circuit and activities well spread throughout the day. I liked the relaxed atmosphere. The main advantage is the view directly over the garages and also a raised view over the paddock which meant you could watch the drivers giving interviews. There wasn't much happening during the tour of the paddock and pit lane, but the mini bus tour of the circuit was an unexpected bonus with a great guide and opportunity to get right next to the circuit. The ticket also allows you to watch from one of the VIP stands. Overall a great experience well worth the money. Worth the trip for F1 Fanatics! After reading hundreds of reviews I decided to take a chance and attend F1 Winter Testing with my husband. A lot of the problems we read about previously seem to have been resolved. The pre-Testing information we received on email was super helpful; no issues collecting tickets, organising our day, knowing where to stay etc. was all easy peasy. We chose the hospitality tickets and will be choosing this again in future. And here's why... Highlights of our trip; - pit lane view from hospitality was perfect viewing - you can wander to the roof or to the grandstand - paddock walk was brilliant and well organised - food and drink in hospitality was very good quality and choice - staff were friendly - meeting new people and connecting with fans is easy Overall we had a great experience and I'm looking forward to attending again next year. Superb access to Renault F1 team. More time in the garage and pit lane than I had expected and amazing insight. Informative and interesting briefs and information provided. Not getting driver autographs, to hear from the drivers and to meet both main drivers was a disappointment - especially given the cost of the experience. Some more time on the pitlane roof and access to the balcony above the garage would have been ideal. My son and I attended f1 testing at Barcelona on the 26th Feb, we had a brilliant day with great access to the grandstands, the close up view at turn one being are favourite spot. Only slight negative is a few more food outlets would help a plus. Fantastic value for money. At the welcome of the day the team winfield has been very caring with us. The day was very well organized, with no downtime. We had a lot of information and all our questions were answered. Renault's team paid us a lot of attention and were not stingy with information. The day was very dense and very rich in meetings interestingly interesting. A perfect day for a F1 fan. I've heard Ted Kravitz say that Circuit Catalunya Barcelona is in the middle of nowhere - literally an industrial estate but surely it couldn't be that hard to find........We travelled from Barcelona by train and as there were no taxi's at Montmelo station so we walked courtesy of our guide Google Maps. Google automatically takes you to Gate 6. No one at the circuit had tried to correct this and it happens all the time - try it. Rather than put up a quick sign or staff gate 6 we were left stood there bemused. travelling clock wise we soon found gate 7. At the main gate we were asked to jog on and complete the rest of the perimeter to gate 3 which was quite a hike. On exiting after all but four hours of practice whilst on our way to Montmelo I checked the entrance road for info signs, arrows or some indication for visitors that they were in the right place - nothing. Poor effort Catalans. In this day and age really poor effort. Wir haben das F1 Testing im Rahmen eines 3 Tage Ausfluges nach Barceloa besucht. Das kann ich nur empfehlen, wir werden das bestimmt wiederholen. Der Circuit de Catalunya ist eine sehr kompakt gebaute Rennstrecke. Man kann zum Testing die meißten Tribünen ausprobieren und findet garantiert einen persönlichen Lieblingsplatz. Der Circuit ist sehr familienfreundlich, mit Picknick Plätzen und Kart Rennbahn. In Kobination mit einem Barecelona Besuch einfach ein tolles und bezahlbares Erlebnis. We had a great time at the tryouts, we wish the sound of the engines imrprove to what it was in the ninetys. Have more food trucks with more varieties of food. Very good location and amazing tour in paddock lane. Time well spent. Great experience! I had a great time. After arriving in Barcelona, rented a car by the train station and drove to Montmelo. Easy to leave the city and drive to the circuit. After arriving I had to collect my ticket by the motocross track. They didn’t have any signs to help you getting there. They need to put more information on the roundabout and at the entrance of the motocross track. After collecting the ticket, drove back to the circuit. Since my ticket was with parking I drove into the circuit and was able to park 2 minutes to my entrance. Again, a lack of information (signs) made me walk around and had to ask someone for the entrance. After getting in I was very welcome by the volunteers. They explain what I was able to do, the food, the drinks, the excursions. Food was good, the location above the garages was good but I was a little sad because of the fact that I wasn’t able to be by the Ferrari garage. I’m a Ferrari fanatic!!! About the excursions I was a little disappointed when I spent the time by the boxes. I was expecting to see the pits open and being able to contact the drivers for a few minutes. People that are going to this events they go because they are really fans. They want to be close to the action. About the ride on the bus, they should have open buses to be close to the action and the noise. After all it was a great experience. Fantastic service from bookf1.com, as usual- thank you. It was great to be close to the cars, drivers and pit crew. Will do this again.